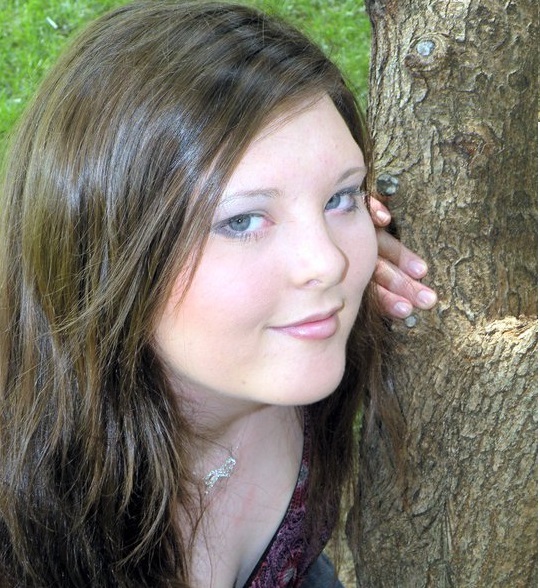 Amanda has been certified in massage therapy since August of 2005, graduating in 2006 from Community Care College with her Associates of Applied Science in Massage Therapy. She operated a private practice on her own in Tulsa before starting her career with Steiner Transocean Ltd. and Princess Cruises. While in London at the Steiner Academy, Amanda also became certified in skin-related therapies and was able to perform facials and mini-facials during her tenure with the company which she continued doing when she came to Fusion as a Skincare Technician. Amanda spent two years with the Steiner as a massage therapist and assistant spa manager aboard 3 different vessels all over the world. During her time at Fusion, she has become certified as a master aromatherapist along with certifications in clinical myofascial release techniques, cervical and sciatic pain relief, and kinesiology taping. Amanda is also currently studying applied kinesiology, postural assessment, acupressure taping, and Ayurveda techniques. She most recently completed her PNMT certification for lower back, legs, and feet with Douglas Nelson in Norman, OK. She will be completing the hands, arms, and shoulders PNMT in June along with another cupping certification in June as well! Amanda joined Fusion in September of 2011 while under the ownership of Nancy Gilliam. She became Fusion's first Senior Therapist, then went on to become Fusion's only Master Therapist. She was approached by Nancy in July of 2013 about becoming the owner of Fusion as Nancy was set to retire to Houston where her husband had been transferred with Phillips. On November 1, 2013, Amanda officially transitioned into her role as Owner and Master Therapist of Fusion Massage & Wellness. 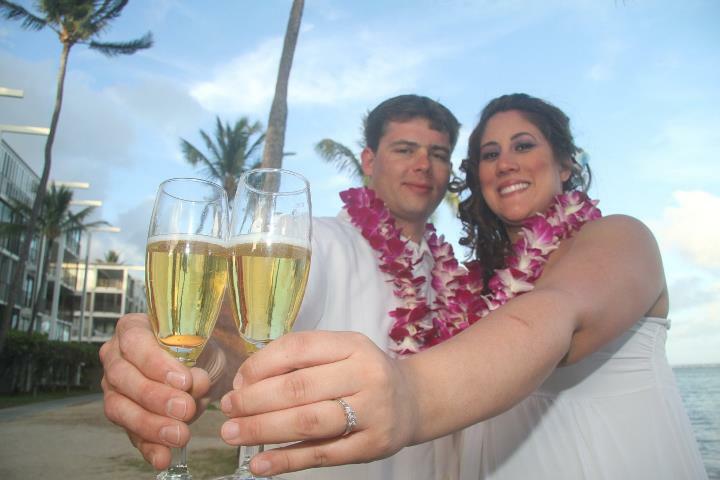 Left: Amanda and Allen were married in Honolulu, Hawaii in August 2011. Along with Fusion, they also own a security patrol company called Elite Guard Services and Security LLC. 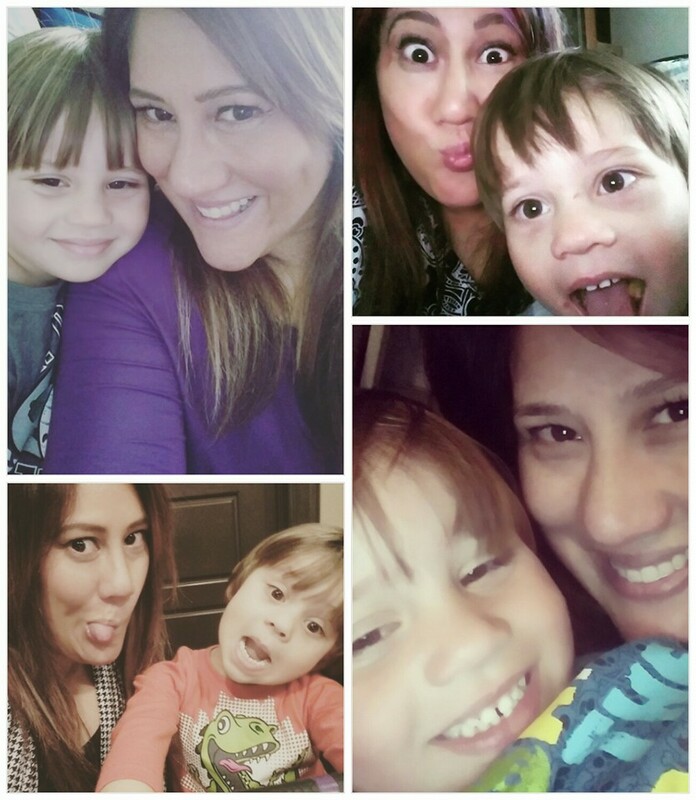 Center: When not at Fusion, Amanda enjoys spending time with her 7 year old son, Anthony! 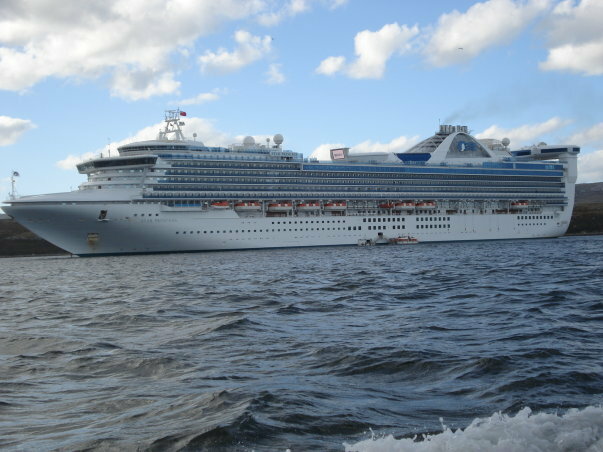 Right: Picture of Amanda's second contract ship the Star Princess anchored off the coast of the Falkland Islands in South America. Amanda traveled all over Europe, the South Pacific to Australia and New Zealand, Antarctica, South America, and the Caribbean. "When my shoulder was in excruciating pain, my primary care doctor spent 10 minutes diagnosing it, decided it was a rotator cuff inflammation, gave me a cortisol shot, and sent me on my way. When that didn't fix it, he suggested that the next step was going to be expensive and painful shoulder surgery that would take years of therapy to heal. Instead, Amanda worked with my chiropractor to diagnose my TOS, and develop a treatment plan with her, her staff, and a physical trainer, that had me healed in 8 months!" - S.E. 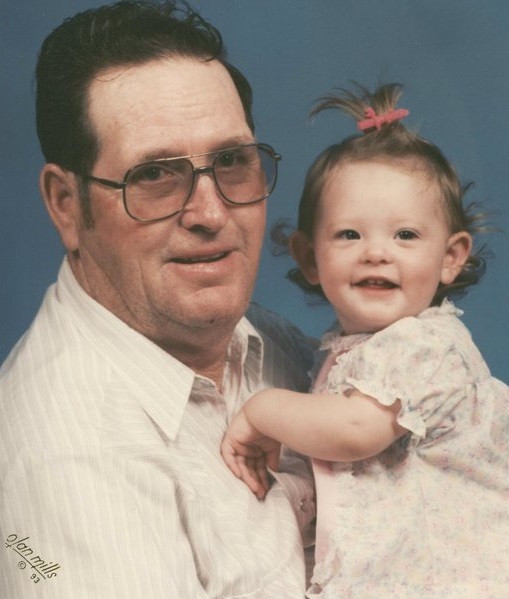 Lauren is originally from Nevada but relocated to Bartlesville to be closer to her family. She has been with the Fusion team since May 2013 starting as manager and moving into the Director position in 2018. Her previous spa and retail experience comes from working at Tangerine Aveda in Reno, Nevada and Ihloff Aveda in Tulsa. Lauren’s attention to detail and enthusiastic work ethic makes for the perfect director for Fusion. She is here to ensure all of our guests at Fusion receive the utmost care when they walk through our doors. Lauren is a pivotal member to Fusion and looks forward to interacting with all of our guests. She is here to answer any questions you may have about scheduling, our services, and all of Fusion's operations. She is the mother of a one year old girl and soon-to-be mother of a little boy due in June 2019. 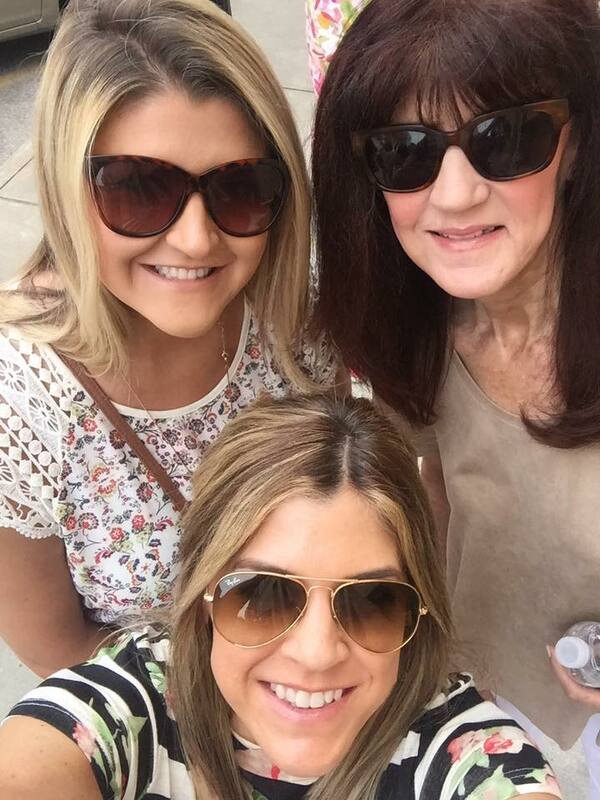 Left: Lauren with her Mom (top right) and sister, Michelle! Center: Lauren and her husband, Jared. 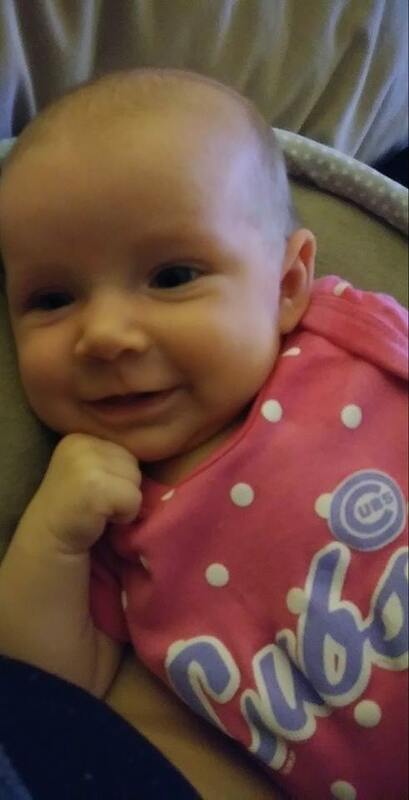 Right: Lauren's new baby girl, Harper! Kebree is a Bartlesville native that attended Tri-County Technology Center earning her Cosmetology license in 2013. She has completed focused training with Epicuren Discovery, PCA, Dermaquest and Bio-Therapeutic instructors. Along with facials, she also performs waxing treatments, eye lash services, microdermabrasion, and chemical peels. Her vast knowledge in our skin care ranges makes for an informative yet relaxing experience in her treatment room. 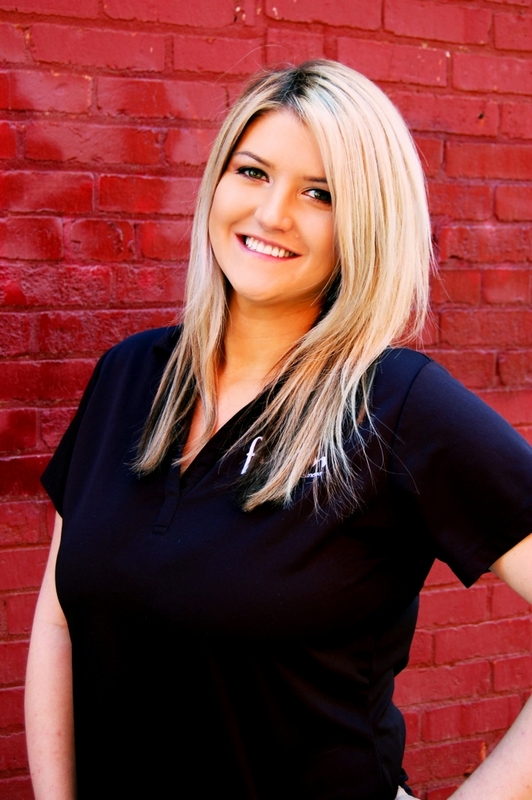 Kebree is our senior esthetics adviser and knows all the ins and outs of every salon service we provide. Since coming to Fusion, she has also earned her certification as a Level 1 Reflexologist and is currently undergoing her massage therapy certification and apprenticeship. Kebree also completed her DeepFeet Ashiatsu Practitioner training in Denver in June of 2017. Her sweet, caring nature and skill is evident in her treatments and post care instruction. 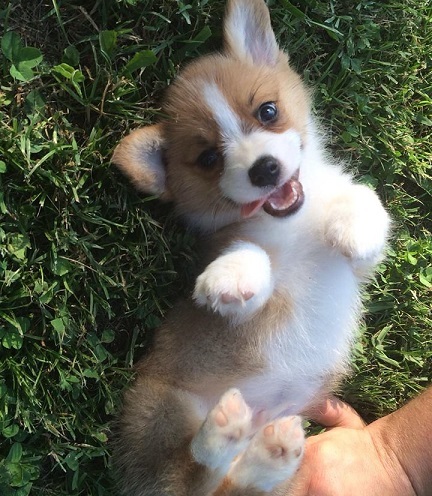 Left: This is Keb's corgi as a puppy! His name is Baelish, and she absolutely adores him! Center: Kebree and her younger brother, Kyeler! 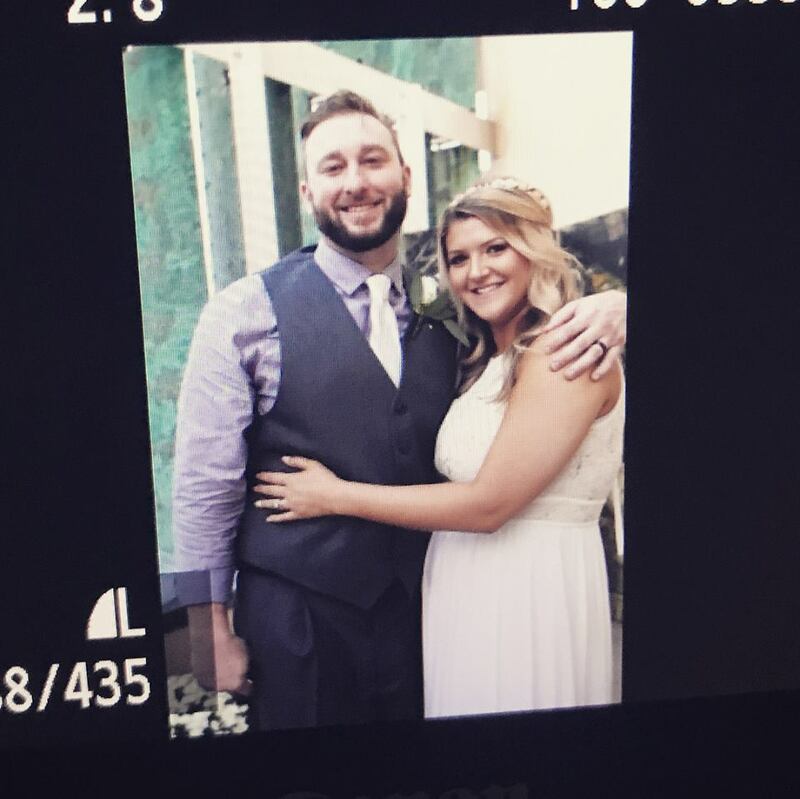 Right: Kebree and her boyfriend, Russell! "I first tried a facial out of curiosity, thinking I would only do it once. After the first session with Kebree, I was hooked! She put me at ease and explained exactly what she was doing. I find the sessions very relaxing. Both my face and myself feel great after seeing Kebree!" - C.H. "I have had massages, facials, and waxes at Fusion and I am never disappointed! I do want to take the time though to give feedback after my Brazilian wax with Kebree today. This was my first wax experience with Kebree and it was the best experience I have had (including both at Fusion and at other locations). Kebree is friendly, professional, and (maybe most importantly for waxing) very gentle in her approach. She made sure I was comfortable and the wax was as quick, painless, and relaxing as it could possibly be. I am looking forward to my next appointment!" - A.W. To Book an Appointment with Kebree, click here. Montyca graduated from Heritage College OKC in April 2014. She specializes in a variety techniques such as deep tissue and Swedish massage as well as Positional Release and Trigger Point therapy. She completed her externship with us and became a full time staff member due to her vast knowledge in the field and extremely honed massage technique. Montyca completed her Level 1 Fascial Movement Taping certification with RockTape. Since she has come to Fusion, Montyca has also been certified in treating rotator cuff problems, chronic shoulder pain, neck and scapular disorders, and cervical pain disorders as well as Holy Fire Reiki 1 & 2. She most recently completed her certification in Advanced Cupping Therapy techniques in March 2018. Montyca's immense skill in the field of massage is evident in her treatments, and we know you will not be disappointed with the fantastic massage she offers. Left: One of Monty's beautiful senior pictures! 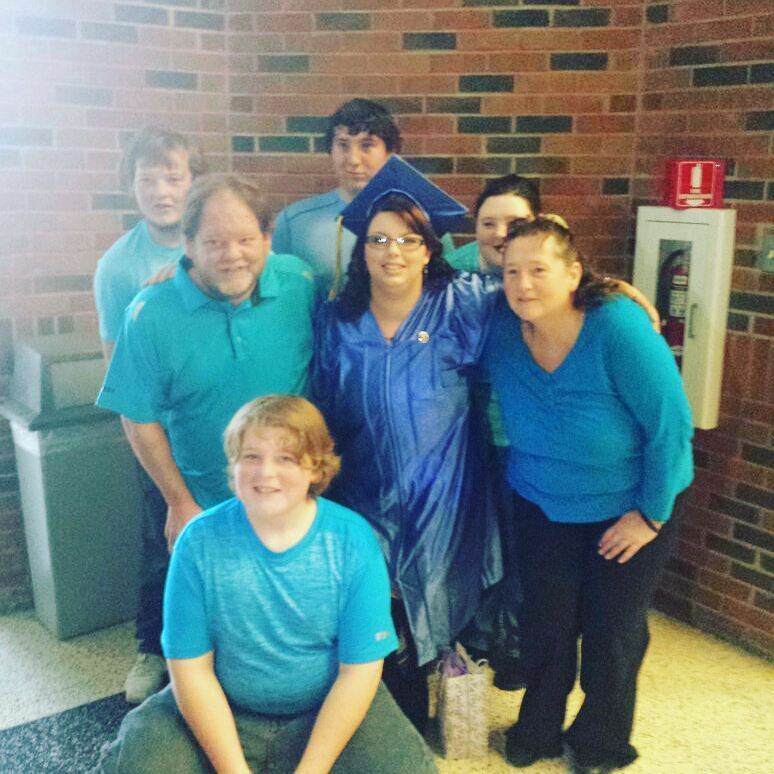 Center: Monty and her family attending her cousin's graduation from nursing school! "I come to Fusion for massage therapy. I have existing issues with my back and since starting my appointments with Montyca, she has not only helped with my existing issues but has found new ones to fix. Montyca is always friendly and professional. While she has only been at this for about 2 years, you would never know it. She is very knowledgeable and always explains to me which muscles she is working and why. She introduces new techniques to address the specific issue I am dealing with. I would highly recommend her to anyone. Although I must admit that I'd rather not share her!" - M.M. "It was amazing! This was my second time with Montyca and she does an amazing job working on my problem areas. She's great!" - W.N. To Book an Appointment with Montyca, click here. Donovan graduated from Heritage College in Oklahoma City in February 2012 and joined Fusion when he relocated back to Bartlesville. 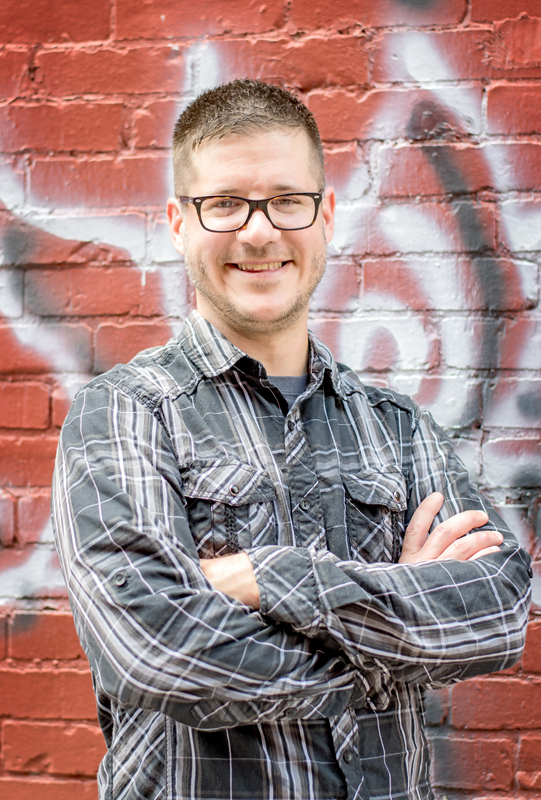 He specializes in lymphatic drainage, gluteal and abdominal release techniques, trigger point therapy, deep tissue, sports massage and kinesiology taping. His dedication and passion for the industry shows through in his technique. While with Fusion, Donovan has completed his Fascial Movement Taping Level 1 & 2 Certification with RockTape. Client's seeking relief through deeper pressure massages have sought out Donovan's technique and seen great results. Donovan's background in rehabilitative massage is one of our most sought after techniques here at Fusion. Left: Donovan visited Warner Bros. studios in California when he visited his family and decided a snap in his Fusion shirt would be just the thing we needed! Center: Donovan, his cousin, and sister (in the Santa hat) at our annual Fusion Christmas Party! We went to Pinot's Palette and had a great time with great food and great painting!! Right: Donovan and his finacee, Kelly. "My therapist ,Donovan, has been working on a pinched sciatic nerve & inflammation since early May. Regular massage has bought pain relief & progressive healing. This has hampered my horseback riding which I am now starting again. Thank you Donovan and all the Fusion staff which makes overcoming chronic problems and back pain." - J.G. "Loved Donovan! He is the first therapist to be able to a deep enough tissue massage to give me relief for my scoliosis and back/hip pain. Also showed me some great stretches using a foam roller!!" - K.M. 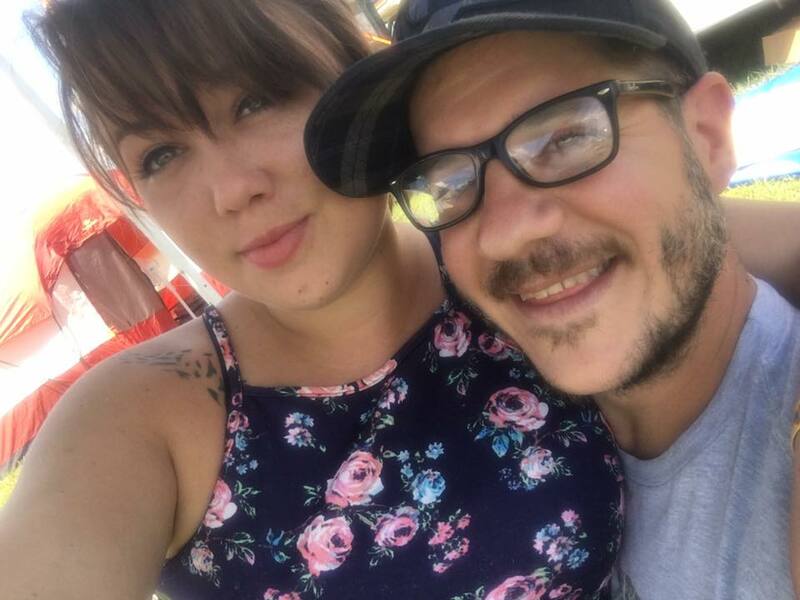 Shawna is an amazingly talented and skilled therapist who graduated from the Flint School of Therapeutic Massage in Flint, MI in December of 2001. Since then, Shawna worked for ABC Back & Neck Care in Fenton, MI for 8 years before moving to Oklahoma. She finally found her way to Fusion, and we are so happy to have her experience and expertise on our team. She specializes in a wide variety of modalities such as Swedish, prenatal, relaxation techniques, and Ashiatsu. Shawna's years of experience and knowledge in the industry shows through in her amazing treatments. For the most relaxing massage in town, Shawna is the therapist to see as she loves to incorporate many of our unique add-ons to her services to accentuate every client's treatment especially with our heated shells, warmed salt stones, and healing Kan-sa wands. Since coming to Fusion, Shawna has been certified to treat sacroiliac dysfunctions and myofascial pain and disorders. Shawna also just completed her Ashiatsu certification with Barefoot Bodyworks in Fort Smith in June 2018. In 2019, she will be adding Custom Mini-Facials and facial add-ons services to her list of treatments she provides giving her an all-around knowledge of the best of what Fusion can offer. Left: Our Fusion "Princess Ariel" is a huge advocate for the use of essential oils! She's a Wellness Advocate for Doterra and loves to share her passion for oils with her clients. Center: These girls are Shawna's three beautiful step-daughters at Sunfest! 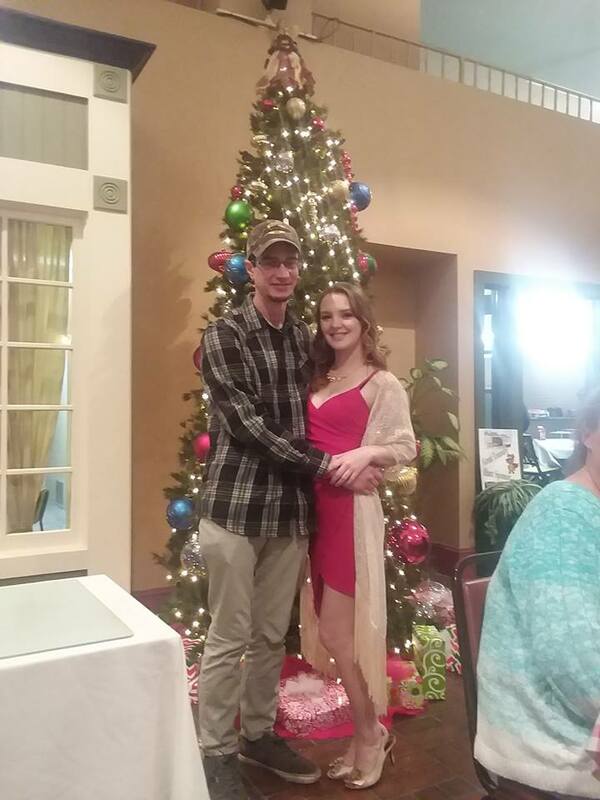 Right: Shawna and her husband, Erich at our holiday party! "First time here and it was fantastic! Shauna did an amazing job with my sleeping beauty treatment. She explained exactly what the service offered and told me to speak up if there were any issues. She was very professional and kind. I have recommended her and this service to all of my coworkers." - L.P.
"I compete in long distance triathlon and spend many hours a week honing my mind, body, and muscles in order perform at the highest armature levels. Recently I developed an intense pain in my upper back area. With a competition looming only a day away, I sought Fusion massage to help relieve the tremendous discomfort I was experiencing while on the bike. The treatment I received did just that and I was able to produce the third fastest bike bike split of the race! Fusion massage has been added to my training toolbox and will be working appointments into my rest and recovery days! I'm a believer! Thanks to Shawna and Fusion for getting me back to racing fast! " - P.S. To Book an Appointment with Shawna, click here. 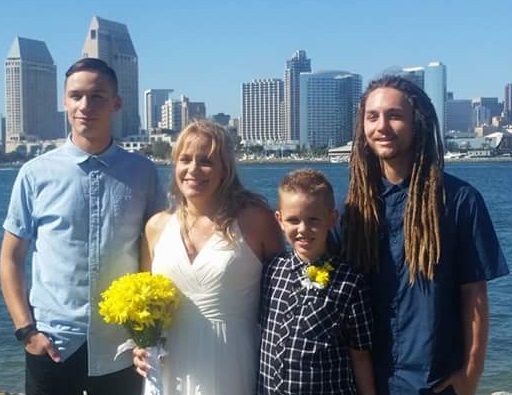 Laura graduated from UEI College in San Diego in 2011 with her therapeutic massage degree. She worked for Massage Envy for several years in California before relocating to Bartlesville. Laura specializes in deep tissue, stretching and sports massage. Her niche is truly in doing deeper, therapeutic work for her clients, and it is evident in the great care and treatment she gives! Laura also specializes in Swedish, prenatal, Trigger Point therapy, and Positional Release therapy. Since joining Fusion, Laura has been certified in DeepFeet Ashiatsu Bar Therapy in Denver in June 2017. If you are looking for a well-trained therapist with great variety, Laura is the therapist for you. Whether you're looking for a relaxing or deep massage, you will not be disappointed with the great services and treatments she has to offer! Left: Laura and her 3 sons! "Laura G. was absolutely fantastic. Everything was incredible. This was my first time at Fusion and she made me feel comfortable and relaxed. Laura assessed my needs and focused on problem areas, always make sure I was enjoying myself. I would definitely recommend Fusion and Laura. " - L.C. "Laura greeted me and told me happy birthday which gave my visit a little personal touch. She did a wonderful job with my massage! I had thought of doing an errand afterwards but was so relaxed, I just went home and melted into the recliner! :) I will definitely schedule my next one with her!" - R.P. To Book an Appointment with Laura, click here. Alyssa graduated from Clary Sage College in Tulsa, OK in May 2017. Although she is just at the beginning of her career, she is an extremely skilled and versed therapist. 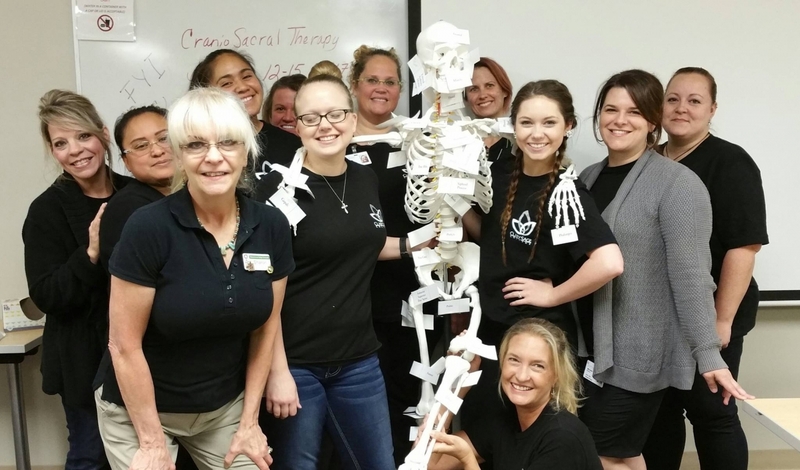 Massage schools have come a long way in the last decade, so she has learned all the current and trending modalities in our industry. 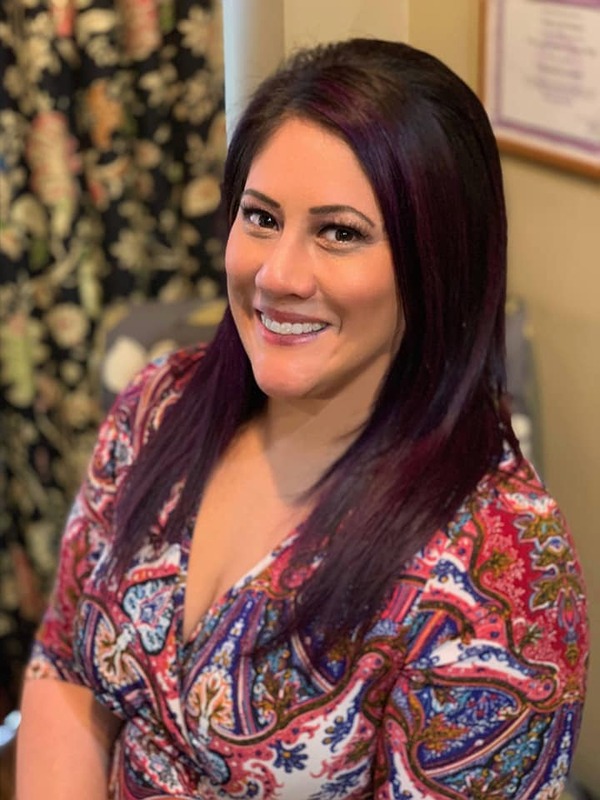 Alyssa specializes in Swedish, Deep Tissue, Cupping Therapy, Yoga Stretching, Reiki and energy work, Trigger Point therapy, and prenatal massage. She also loves doing hot stones! 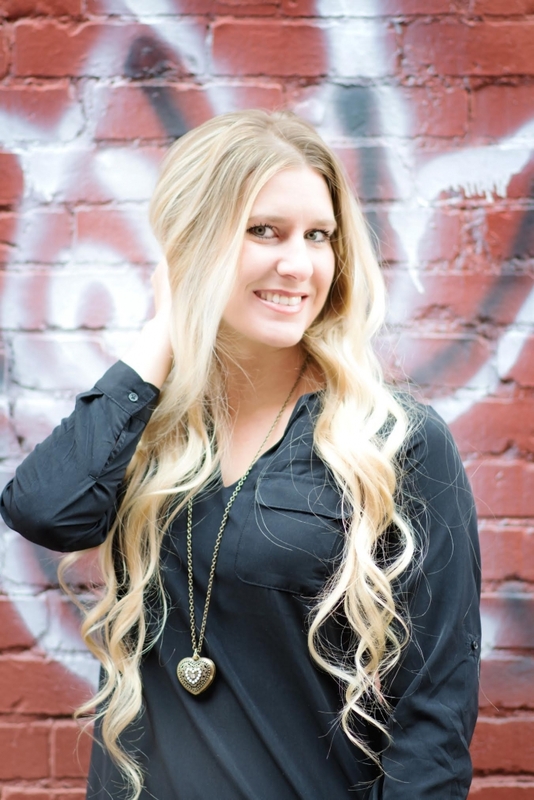 Alyssa is a great, well-rounded therapist that we are so happy to have added to our team. She most recently received her RockTape KT Taping Level 1 certification in December 2018. For 2019, Alyssa has been trained on our Custom Mini-Facial and is excited to add this and the facial add-ons to her list of services she can provide. Her one-of-a-kind treatments are sure to win you over and make you feel relaxed, rejuvenated, and pampered. Left: Alyssa with some of her classmates from Clary Sage College in Tulsa! Center: Alyssa at her graduation ceremony from Clary Sage College in May! 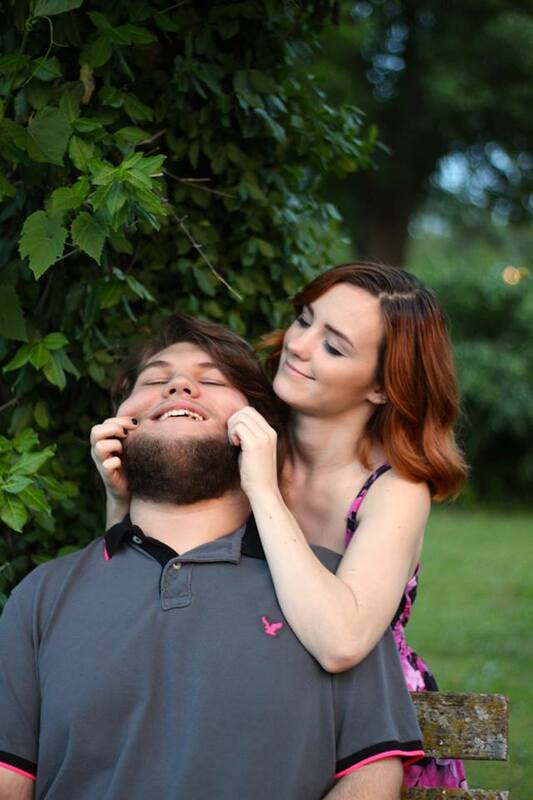 Right: Alyssa loves to sing and was able to be a contestant on The Voice during auditions in Oklahoma City. "Alyssa really listened and responded to my needs. She put my anxiety and nerves at ease with wonderful information about what would help my ailments. I would recommend Alyssa to anyone and everyone from people who are like me with a few ailments to someone who just wanted to have complete relaxation. " - C.S. "Even though Alyssa is newer to massage, you won't regret getting a massage from her. I have had many massages from many different therapists over the years, and you can tell she had the skill to become one of the greats. Whatever she learned in school was more than enough! Not only did she work out my tension, but it was also one of the most relaxing experiences I've ever had. Definitely recommend her for your massage needs if you visit Fusion. - A.C.
To Book an Appointment with Alyssa, click here. Alisha is a 2017 graduate of the cosmetology program at TCTC. Originally from Las Vegas, Alisha came to Oklahoma in search of a new place and life and currently lives on a cattle and horse ranch south of Bartlesville. Her talent for this industry shows in her amazing treatments! Alisha specializes in nail treatments, full body waxing, microdermabrasion, facial treatments, and the Sleeping Beauty. She was recently certified by Dermaplane Pro of Tulsa in Dermaplaning and completed one year of eyelash extension training along with a volume lash training in January 2019. For top of the line esthetics services with a gentle and caring touch, Alisha is unmatched and ready to provide you with care and comfort. "[Alisha] is super sweet as soon as you walk in the door. I've never left upset or disappointed. To Book an Appointment with Alisha, click here. 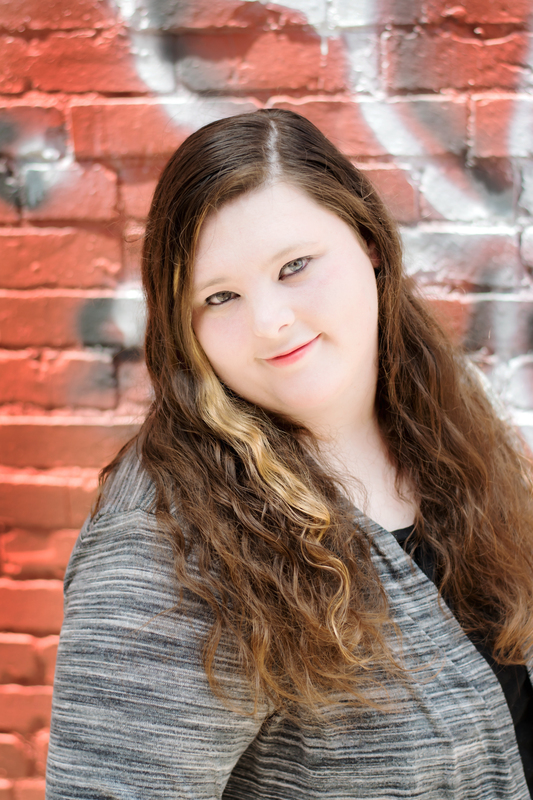 Katie is a 2010 graduate of Heritage College in Oklahoma City and 2018 graduate of Tri-County Tech's cosmetology program. She specializes in Swedish, clinical massage, trigger point, Ashiatsu, prenatal and hot stones. 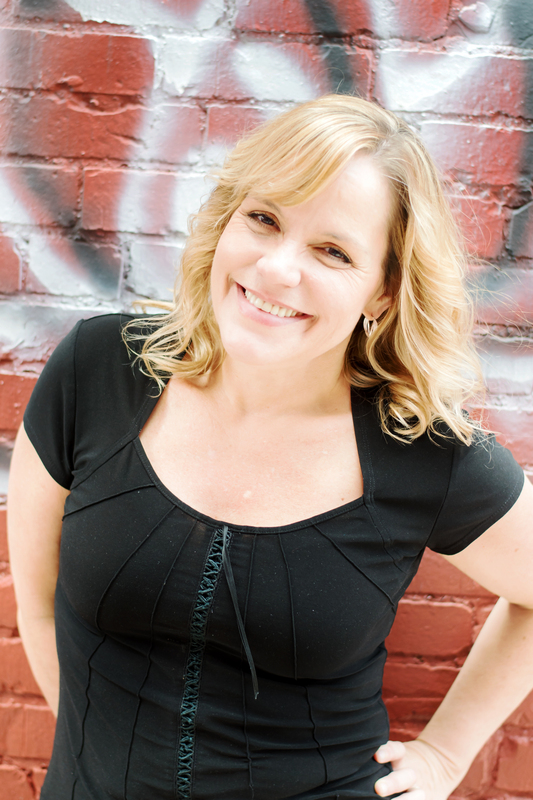 Katie is a DeepFeet certified Ashiatsu practitioner and certified in aromatherapy consulting. While with Fusion, Katie became a level 1 certified Reflexologist and a level 1 FMT taping specialist with ROCKTAPE. Her extensive knowledge in the field of massage is evident in the amazing services she provides. Katie now provides esthetics services exclusively on every other Saturday. See store for details! Currently, Katie is training to receive her instructor's license and will be training on Dermaplaning in March. She goes above and beyond with her treatments, pre and post care instruction, and client follow ups ensuring the best possible service to all her clients. Katie is truly an amazing asset to our team, and we are so glad she is back with us at Fusion! To Book an Appointment with Katie, click here. Nancy Gilliam founded Fusion Massage & Wellness LLC in 2007 in Bartlesville, OK. Fusion’s mission is to bring the healing art of massage therapy and wellness practices to those they are privileged to serve. Nancy has a passion for helping people to live a healthy, balanced life. She is now retired and enjoying her grandchildren from Tulsa, OK. Nancy encourages all to live the life of their dreams in the body and mind that they love.